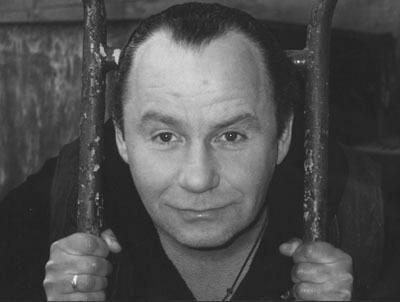 Alexander Kozlov, born in 1950, has worked as a professional actor for over 30 years. He began in the Central Children?s Theater in Moscow in 1973 where he performed leads in numerous productions, including The Little Humpbacked Horse, Chin-Chraka, The Young Guard, The Seven Goat Kids and other productions. In the 1980s he studied acting and directing with Anatoly Vasilyev and, upon graduation in 1989, was admitted to the troupe of Vasilyev?s famous School of Dramatic Art. There he performed in the legendary production of Pirandello?s Six Characters in Search of an Author, which toured the world for several years. Among another half dozen Vasilyev productions and laboratory works in which he participated were Dostoevsky?s The Devils and Uncle?s Dream. After 1994, Kozlov worked in various theaters and independent theater projects, including the Benefis Theater, the Ruben Simonov Theater and the popular commercial production of Per Olov Enquist?s From the Life of Rain Worms under the title of Hanna with Anna Kamenkova in 1998. He performed in two productions of Oleg Menshikov?s 814 Theater Association: Alexander Griboedov?s Woe from Wit (1998) and Maxim Kurochkin?s Kitchen (2000). In film, Kozlov has had significant success in China, where he played leads in two popular television mini-series, Our People — Our Faith and The Dawns of Hong Kong. As a director, Kozlov staged a dramatization of Anatoly Mariengof?s novel The Cynics under the title of Cynics — Magdalen in 1992. Alexander Kozlov plays Oedipus in Ariston.